Suites at the Taj Krishna are comfortably opulent with king beds and views of the city on one side, and the lush greenery of the hotel and Husain Sagar Lake on the other. Suites offer guests a large desk and a 25-inch TV so that both work and relaxation are amply taken care of. All the suites have all the modern conveniences that you can think of touched by the inimitable Taj elegance and thoughtfulness. The Presidential Suite includes a spacious living room, a separate dining area and a master bedroom and wears the ambience of a luxurious residence. One of the special privileges of staying in this suite includes the use of its private pool. The Deluxe Suites are elegantly appointed two-room units with a separate sitting room and a bedroom. The suites with private balconies offer a beautiful view of the city. Deluxe Suites offer all the amenities of the Taj Club Lounge. The Luxury Suites have all the amenities of Deluxe Suites. They have a 5-fixture bathroom with a Jacuzzi. Luxury Suites offer all the amenities of the Taj Club Lounge. 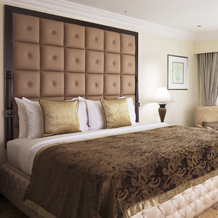 Rock and Roll in One of these Suites of the Taj Krishna , Luxury Hotels in Hyderabad.